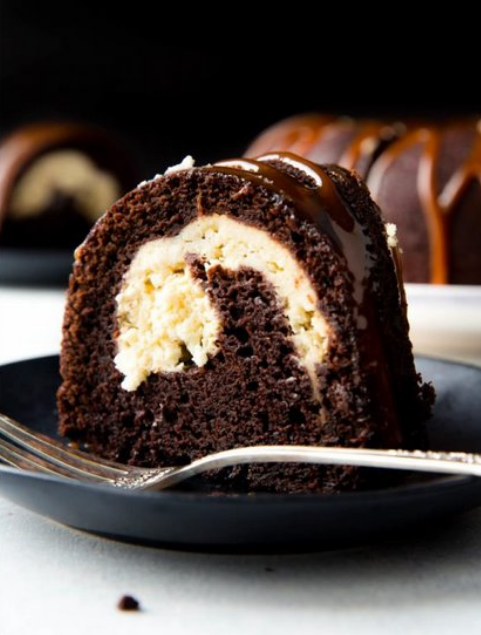 This chocolate bundt cake starts with chocolate, but ends with salted caramel. Somewhere inside that super moist chocolate crumb is a swirl of cheesecake. Preheat the oven to 350°F (177°C) and grease a 10-inch bundt pan. Whisk the flour, cocoa powder, sugar, baking soda, baking powder, salt, and espresso powder (if using) together in a large bowl. Set aside. Using a handheld or stand mixer fitted with a whisk attachment (or you can use a whisk) mix the oil, eggs, sour cream, buttermilk, and vanilla together until combined. Pour the wet ingredients into the dry ingredients, add the hot water, and whisk or beat it all until the batter is completely combined. Set aside as you prepare the cream cheese filling.